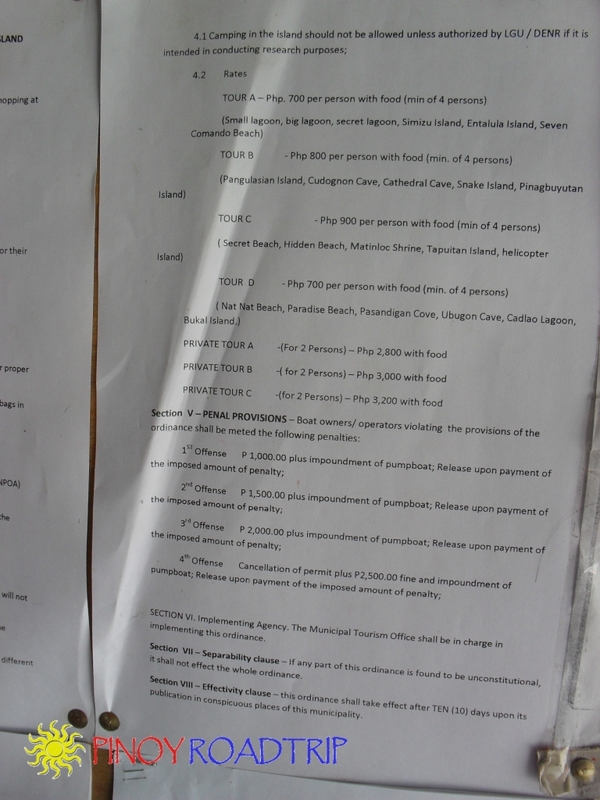 The municipal ordinance that standardizes the rates of tours in El Nido. With the standardization of rates, how do you choose your guide? 1. Each tour guide offers different places to visit for Tour A, B, C.
As you will see below, although Tour A usually includes the Small Lagoon, the Big Lagoon, the Simizu Island and the 7 commandos, some include either Entalula Island or the Secret Lagoon. Although the ordinance states 6 places to visit in Tour A, the standard rate usually applies to 5 places to visit per tour. Some also offer 6 places to visit but with my experience, 6 places to visit per tour may be too many and the visit per place will be too fast. 2. Ask what food is included. 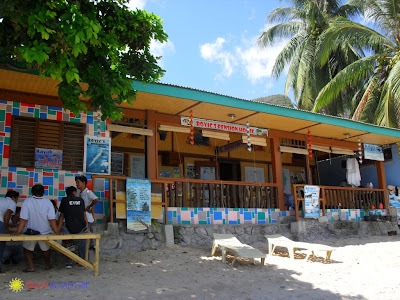 Standard food included is grilled pork/chicken, grilled fish, vegetable salad, rice, fruits. 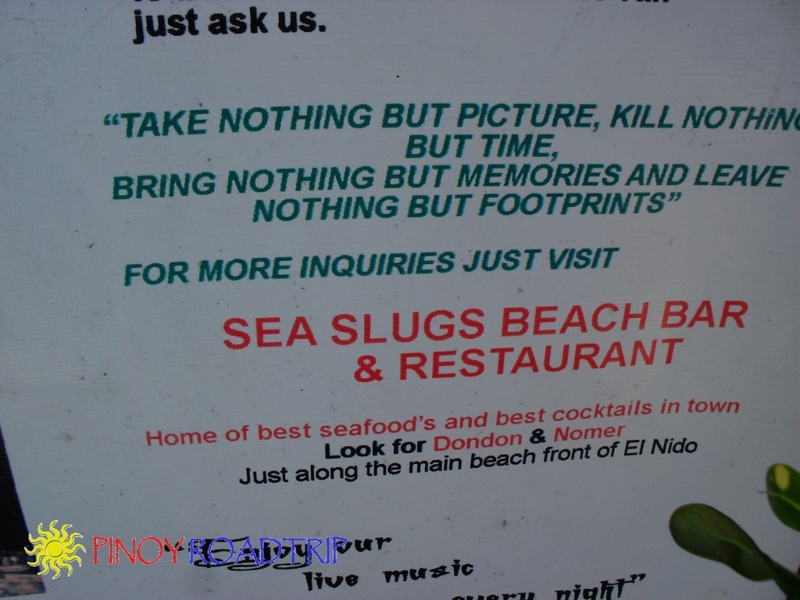 But you still have to ask just to be clear about what food they serve. Drinks are not usually included but some tour operators include drinks for free. 3. Ask what time the tour starts and what time it must end. 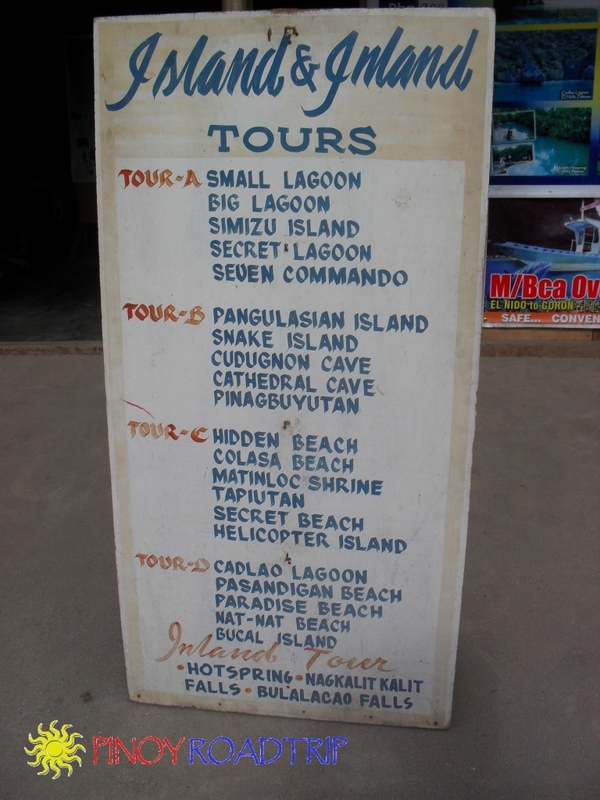 A lot of the tours start at 8am and end at 5pm. 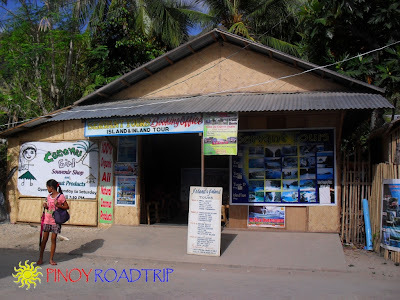 Our tour with Rovics Pension start at 9am and ends at 6pm. 3. Ask if snorkel and mask are included. 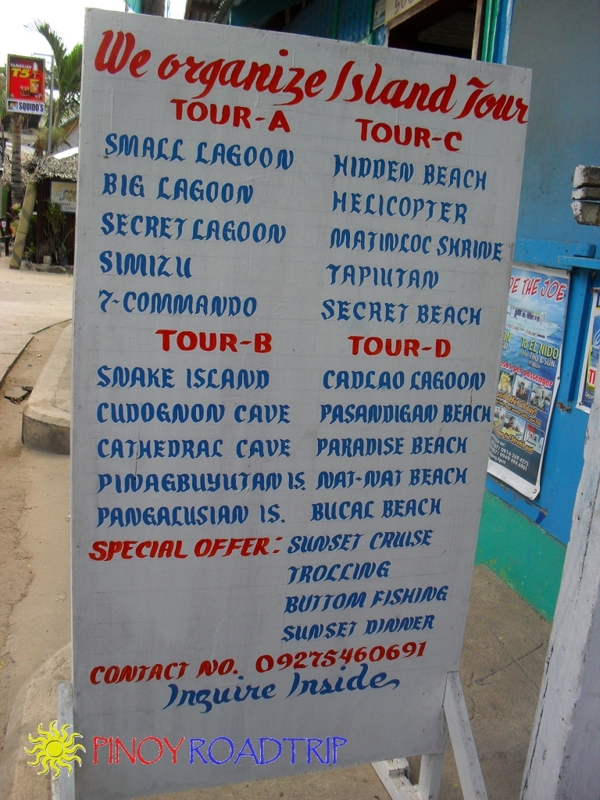 It's usually not included but some tour operators include it as a freebie. 3. Ask for a discount, especially if you are in a large group. 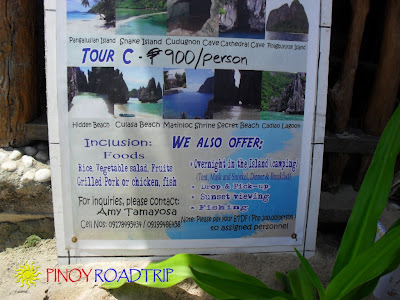 As a rule, they are not allowed to charge rates different from those indicated by the municipal ordinance, but you can ask for freebies like additional islands to visit, include drinks with the food offered, or include snorkel and mask for all in your group or for just a few. NOTE: You can book your tour guide when you arrive because there are so many island hopping tour operators you can choose from. 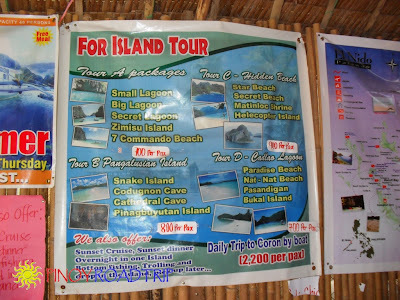 Restaurants and resorts also offer island hopping tours. For hassle free booking, you can book through your hotel or resort. 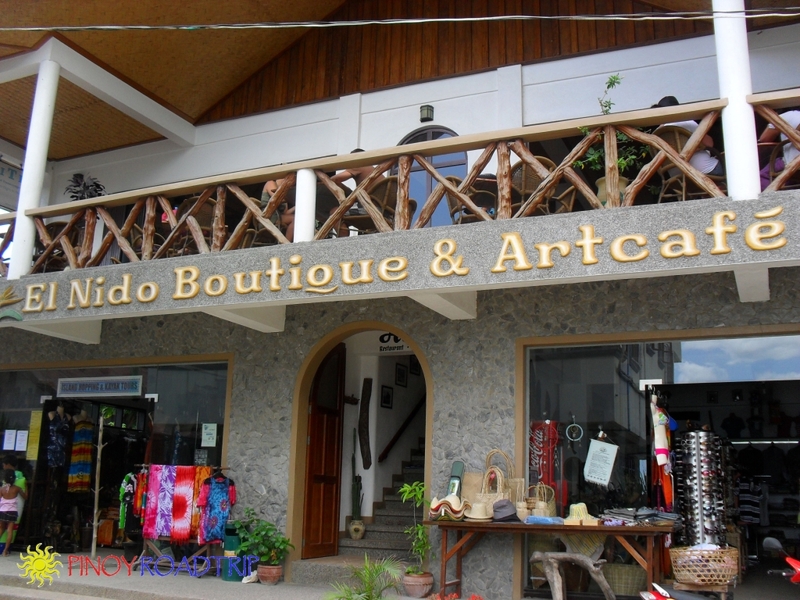 Unlike in Bohol, booking through your hotel or resort will not turn out to be more expensive than the others because of the existing municipal ordinance standardizing rates. 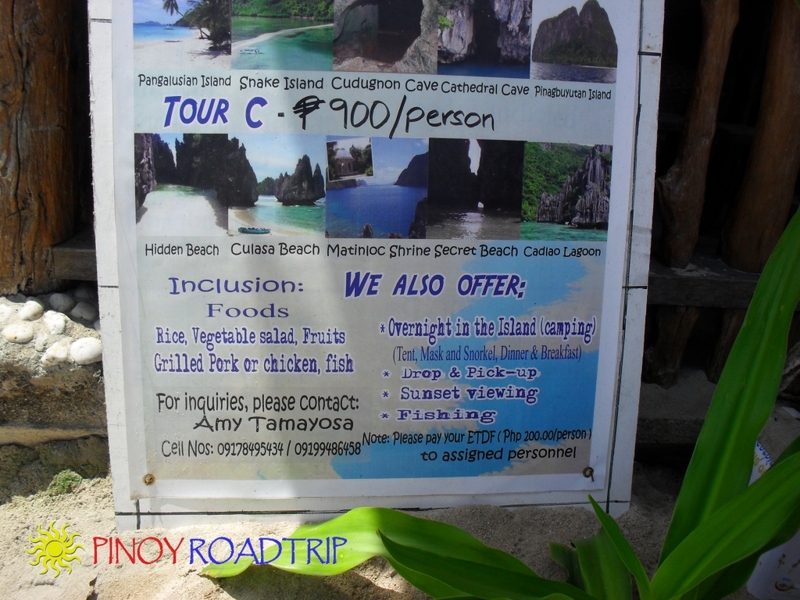 Tour C is P900/pax: Secret Beach, Talisay Beach, Hidden Beach, Matinloc Shrine & Helicopter Island. 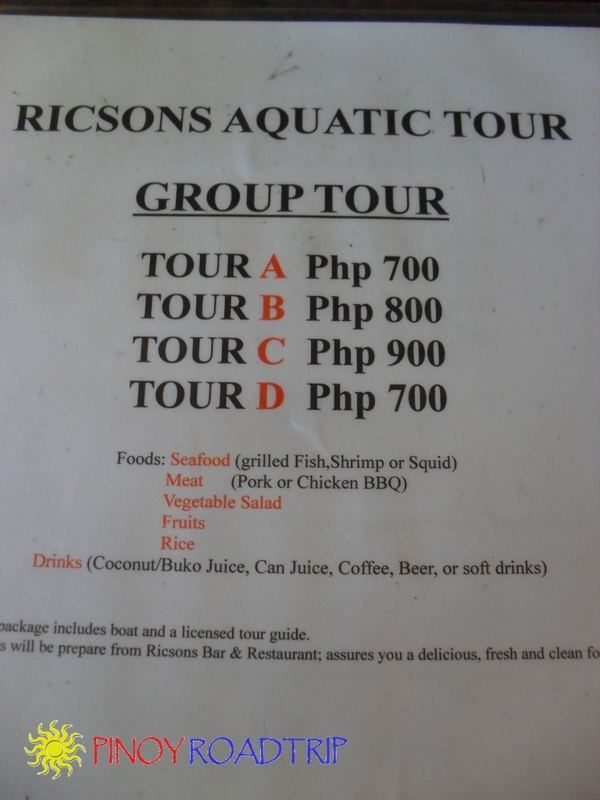 Food includes Grilled fish, Grilled pork or chix, Veggie Salad & fresh fruits. Drinks are excluded only food (picnic lunch) is included. There were slight deviations in the tour when we got there because of the filming of Survivor Series, Swedish edition. 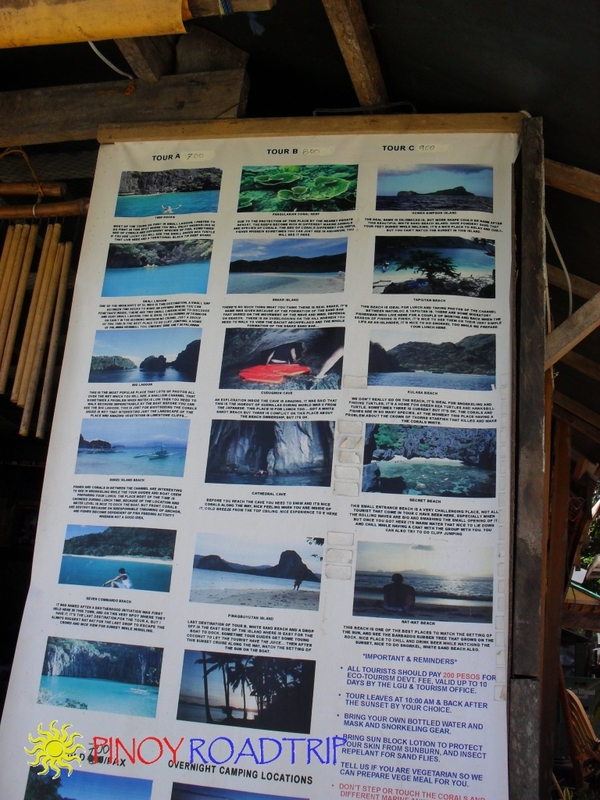 We were prohibited to visit some sites like the Big Lagoon and Helicopter Island. 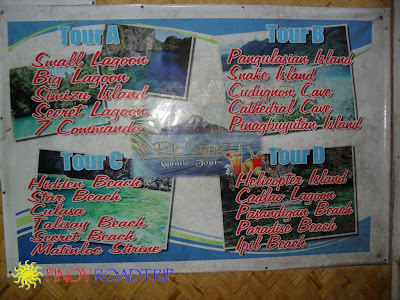 They replaced some sites with Star Beach and Nat Nat Beach to make up for the sites included in the tour but we were not able to visit. 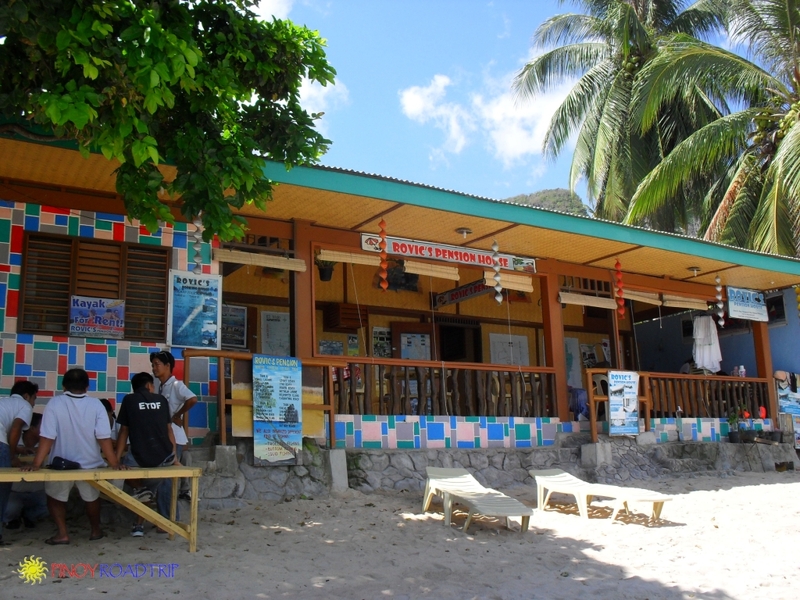 Another deviation is the lunch at Talisay Beach. 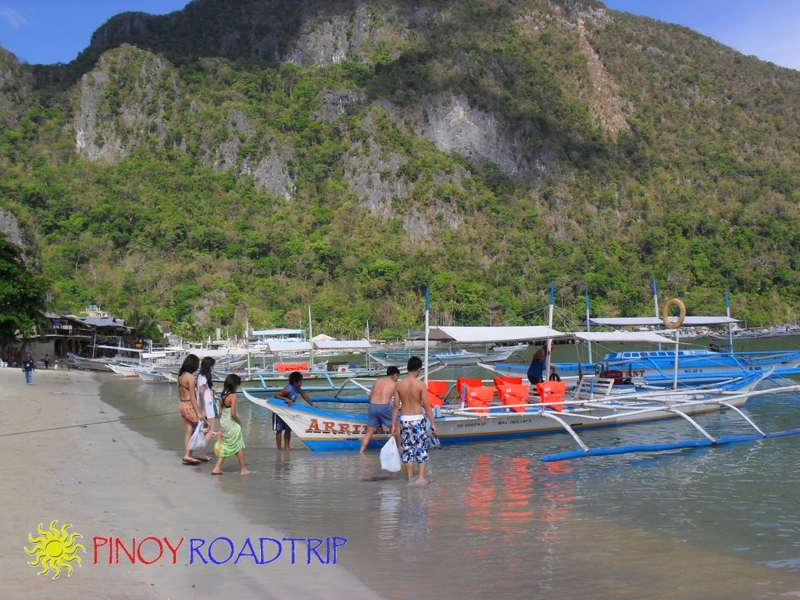 There were already many tour boats docked in that beach so our boatmen found another beach that has no people on it. but info above may be useful just the same. oh yeah! i love this place. i was there a month ago. Hi. Thanks for the info. 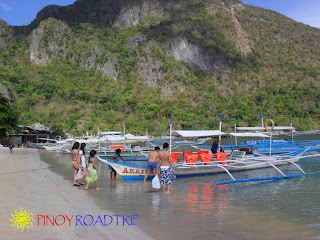 What if hindi umabot sa minimum number of people per boat? Kami lang kasi dalawa ng bf ko, is it possible na the same rates would be applied? 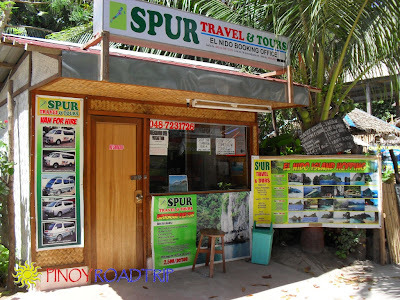 You can get the same rates if you agree to a shared tour, which means you will be joined with another group, so the minimum number of people per boat will be reached. 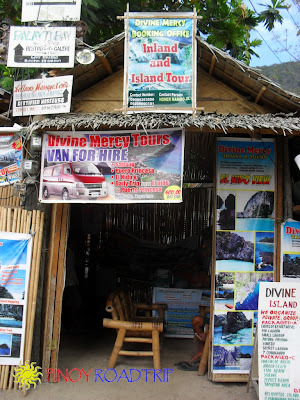 If you want a private tour, you will have to pay the minimum number of people per boat. I suggest you ask the tour guide. Everything is negotiable because of the competition. They may agree to the same rates for a private tour for only 2 people. 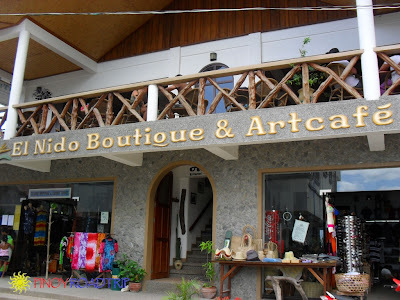 At El Nido Boutique and Art Cafe, they usually allow the same rates for a shared tour and can usually find people to share the tour with you coz they mostly cater to foreigners. 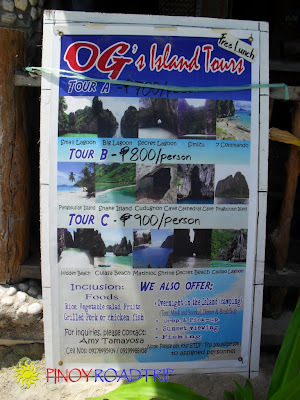 But I still suggest you try the other tour operators. 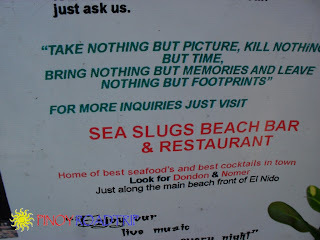 As I said, everything is negotiable. can we have our own time slot with the tour? 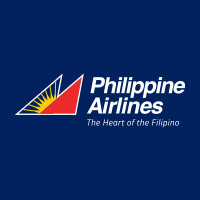 babalik pa kasi kami sa puerto after the tour. You can actually be the one to decide the time and where to go if you're on a private tour. They will just charge you accordingly. You can't do so if you share the tour with another group. 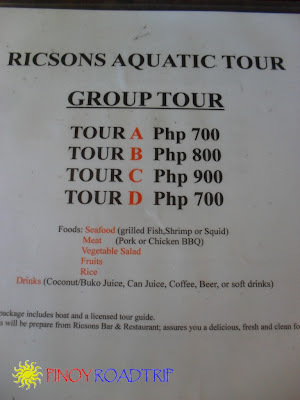 So I suggest you get a private tour so you can customize it according to your own schedule. 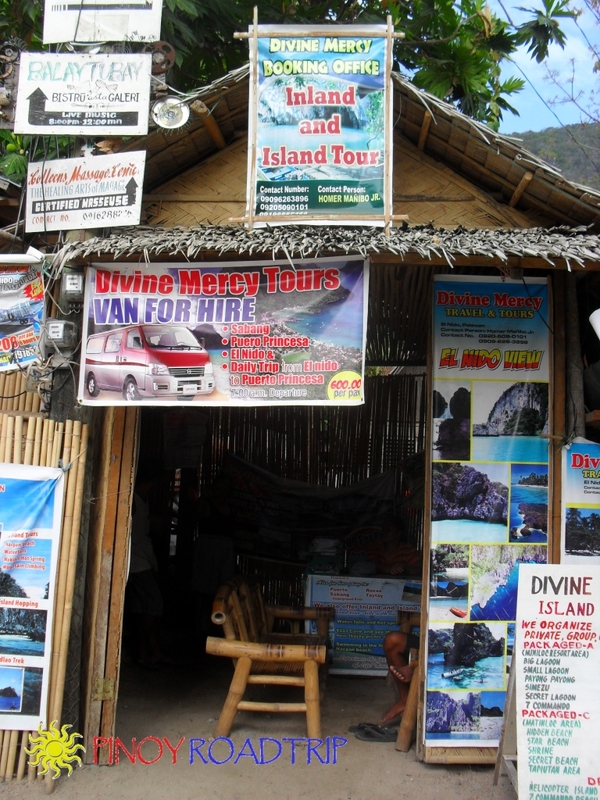 As I said before everything is negotiable with the tour operators. hi. 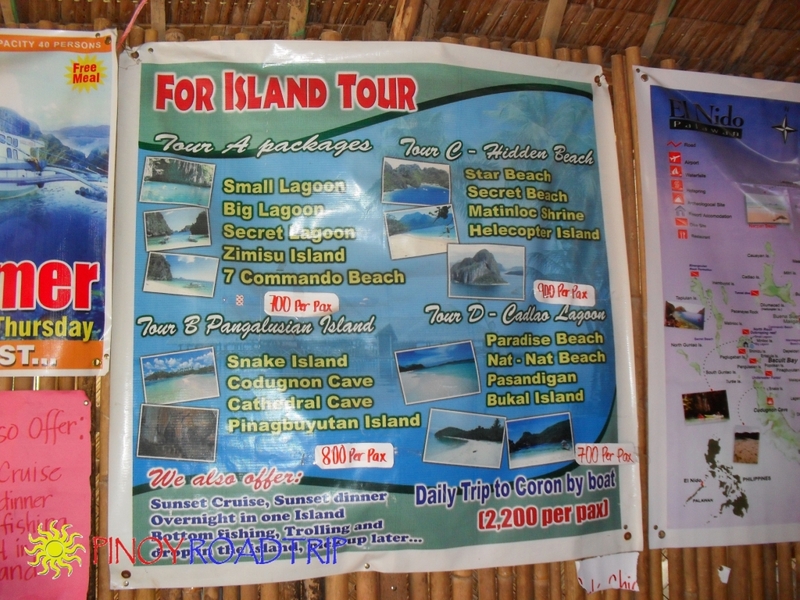 What is the maximum number or people per boat excluding the tour staff? thanks. 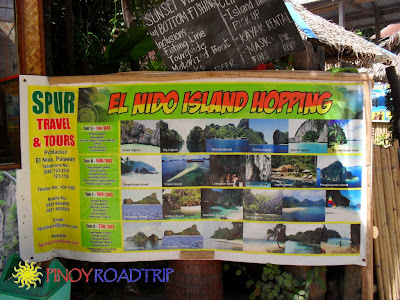 I'm currently planning to prepare for a trip to El Nido. Thanks so much for these information.